Belonging to the British upper crust isn’t always golden, especially during World War II before the Americans got drawn in and England was at high risk of invasion by Germany. On the war front, the country’s young men are dying by the thousands; on the home front, everybody has to sacrifice for the war effort. At Farleigh Place, home of Lord Westerham, the family must scrimp and save like everyone else while also billeting troops, sheltering orphans—and contributing spies. Three of Lord Westerham’s five daughters volunteer or are coerced into secret service. One is employed on the code-breaking team, spying on the Germans; another gets stuck in France when the war breaks out and is forced by the Germans to spy on the Resistance, but then becomes a double agent to spy on the Germans, too; another one sleeps with a spy without knowing it. The youngest daughter spies on the household and village, while family friend Ben Cresswell, the vicar’s son, spies on them all to help uncover a plot that will force Britain to surrender. Meanwhile, Ben’s wealthy best friend Jeremy, a hotshot pilot, joins the RAF and is shot down behind enemy lines. He survives and escapes from a German prison camp and miraculously finds his way home, loaded with information from the other side. His girlfriend, Pamela (Lord W’s code-breaking daughter), is in love with Jeremy and expects to marry him, but they become alienated by the imperative to keep their war work secret from each other. At the same time, Ben is in love with Pam and has been since childhood. His secret work ultimately intersects with hers, and between them they untangle the spy-versus-spy-versus-spy web to find the traitor who, if successful, will change the course of history. The story’s trigger event is a German spy in British uniform parachuting to his death in Farleigh Field. The location, and the fact he’s carrying nothing but a photograph, suggest a failed rendezvous intended to occur nearby, potentially involving the Westerhams and their privileged circle. The story moves smoothly and steadily from a pastoral summer afternoon to an assassination, and is told mainly through Pam’s and Ben’s alternating viewpoints. (Some chapters sidestep to secondary characters so readers can experience events crucial to the plot when Pam and Ben are elsewhere.) Along the way everyone’s morals and fortitude are tested to the max and secrets are exposed, creating a mystery solidly set during a critical period of world history. Author Rhys Bowen makes the time and place believable, showing the thoroughness of her research and understanding of the times. Readers who demand historical accuracy in their novels will appreciate her author’s note specifying where she took liberties with facts. Readers who just want a ripping story will appreciate Bowen’s clean, capable prose, which comes from a long career writing dozens of mysteries (divvied up into the Constable Evans, Molly Murphy, and Royal Spyness series) on a foundation of young-adult novels. 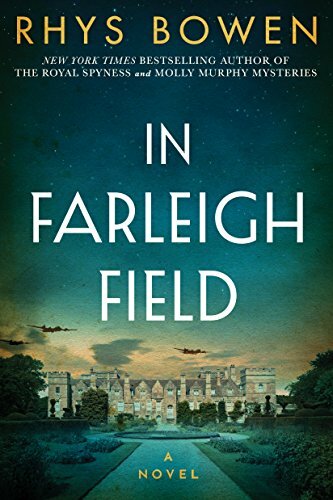 In Farleigh Field delivers the same entertainment mixed with intellectual intrigue and realistic setting for which Bowen has earned awards and loyal fans. She will probably earn more of both with this stand-alone novel.